Alaska Garden and Pet Supply, a company patronized by backyard farmers, large scale agriculture and most of Alaska’s big box stores, won the Alaska Manufacturer of the Year Award on July 24. Also known as Alaska Mill &Feed, Chief Operating Officer Ken Sherwood and company President Joel Klessens accepted the Made in Alaska Award at the Anchorage Chamber of Commerce’s Make it Monday Forum. Gov. Bill Walker presented the award. He spoke of the company’s 11 trademarks, 65 employees and the many “stories within stories of stories,” that marks 67 years in business. Most of it took place in the distinctive red buildings alongside the railroad tracks in Downtown Anchorage that has become an iconic Alaska business, he said. Alaska Garden and Pet Supply was founded in 1950 on the principles and innovations of Don Donatello, an MIT chemical engineer who trademarked his products. Today, the company operates a garden and pet wholesale distribution business and the Alaska Mill &Feed retail store in Anchorage. It was recognized for its nearly seven decades of operation, adding a feed mill in 1965, a fertilizer blending plant in 1978, and a liquid ice melt facility in 2015. 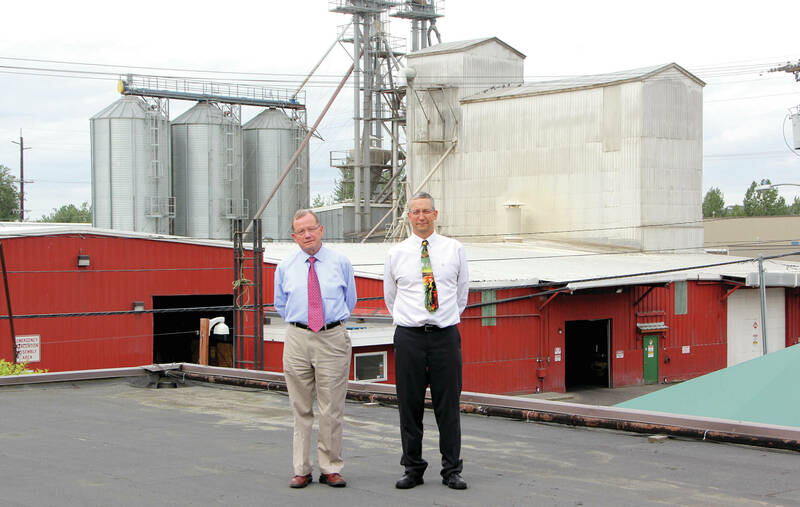 Sherwood and Klessens said Alaskans tend to know Alaska Mill &Feed by its iconic storefront. It began with Donatello’s ideas for bleach cleaners and waxes sold to the Anchorage School District and local companies. Later he had the idea to make feed for reindeer herds, horses, cattle, chicken and other farm animals in bulk at the distinctive mill he built and tied into the railroad so that he could receive bulk shipments from out of state needed as ingredients. Hopper cars from the Midwest and Canada continue to supply salt, fertilizers ingredients, and corn and soy for feed meal. “Some guys always make the right decisions and Donatello was like that. He was a smart entrepreneur, a brilliant man,” Klessens recalls of the man who hired him 32 years ago. For example, Donatello was honored as the U.S. Small Businessman of the Year in 1965 in award presented by President Lyndon Johnson. Major customers in the Matanuska Valley and farming communities down the Kenai Peninsula and north to Delta Junction came to depend on the animal feed. The mill sold to distributors throughout the state. In the 1970s, Donatello added the fertilizer blending plant, and the retail operation opened. Later, they added the Arctic Melt and Arctic Grip products. Klessens, with his business-public relations degree from Montana State University when Donatello hired him, focused on wider business distribution. Following in Donatello’s footsteps, he also developed a line of Arctic Birdseed for specific migrating bird species that is now trademarked. In the winter, the company manufactures ice melt. The plant turns to making fertilizer in the spring and summer. All of these products are made in the feed mill and plants behind the store on a spread that takes up more than two city blocks. They also make specialty feeds for musk ox, moose and bison, using nutritionists’ guidance for specific state-sanctioned programs. The items are Alaska specific, a sure selling point since lots of products made Outside fail to suit the subarctic environment. Mill &Feed sells directly to these large box stores in Alaska today, including Fred Meyer, Sam’s, Costco, Walmart, Home Depot, Lowe’s, Carrs-Safeway, and True Value. Agriculture changed in the past six decades, shifting from big dairy and meat farms to “backyard farmers,” who keep a few chickens and raise their own produce, said Sherwood, who started with his father-in-law’s company in 1973. At that point he was selling cleaning products to the school districts. “Today it’s different, but agriculture also is doing very well. A lot of green houses are going up, a lot of small and big farms are in operation, and a lot of produce is being grown in Alaska,” Sherwood said. The company trademarked 11 products: Arctic Melt, Arctic Grip, Arctic Grow Fertilizer, Arctic Wild Bird Seed and the various animal feeds, including one Sherwood developed that is safe for moose to eat and is sold only to sanctioned buyers. In 2016, the operation stepped into a new ownership configuration under an employee stock ownership plan, or ESOP. When Don Donatello died in 2002, business ownership went into a family trust. The Donatello Family Trust sold all its shares to the ESOP, Klessens said. It’s fitting the Manufacturer of the Year Award, like company profits, is shared with all the employees, Sherwood and Klessens say.